Your friends have gathered on the patio and the grill is hot. Sounds like the beginning of a perfect evening. The only downside is that barbecues often tempt us to consume food and beverages that are hard to digest and difficult to burn off. Naturally, you want to keep in shape, especially before your upcoming beach vacation. But fatty sauces, grilled meats and beer aren’t exactly the best choices for your waistline. That’s why we have put together some tips and tricks for you on how to make your BBQ evening a little friendlier on your figure – without having to sacrifice taste. Plus, we have several delicious recipes that we are sure you won’t be able to resist. It doesn’t always have to be steak: Nowadays, it is pretty well known that consuming too much red meat can cause cancer and other diseases. 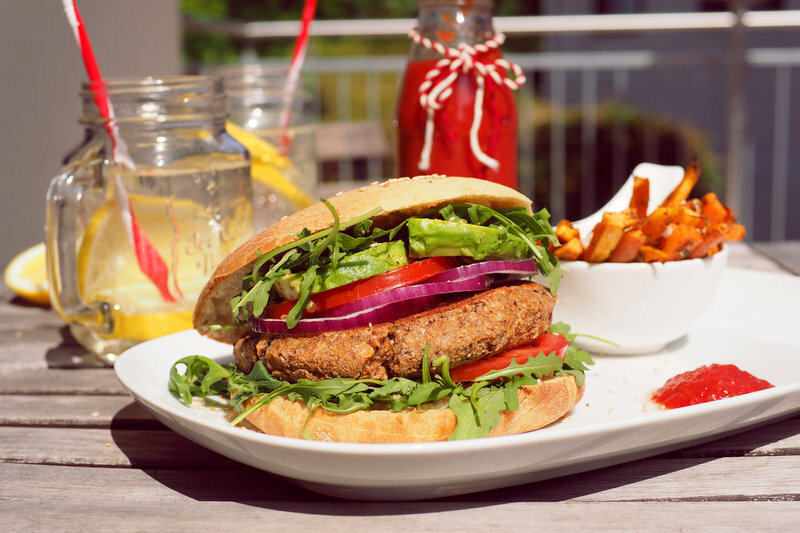 Try eating lean chicken, fish or a veggie alternative like tofu, a veggie burger or grillable cheese. Be bold with colors: Decorate your table with a colorful array of foods. This can include a wide range of salads, homemade ice cream as a dessert or vitamin-enhanced water with cucumber, mango and lemon. Do you want to whip up a tasty cocktail? Then we have a yummy tip for you: Just mix watermelon with a dash of mineral water and some mint. Serve this vibrant drink with lots of ice cubes. It not only tastes fantastic but is amazingly refreshing on hot summer days. Don’t buy it, make it yourself: Salad dressings and BBQ sauces are full of hidden calories and sugar. Make your own yogurt sauce with herbs and garlic. It tastes just as good as the store bought variety and contains less additives. Stick to protein and vegetables: No matter how tempting that baguette looks, leave the breadbasket alone and fill up on fish, grilled vegetables and salad. Or try eating whole-grain bread instead. Eat slowly: Take your time when you eat, chew slowly and set your silverware down from time to time. This allows you to pay more attention to your friends and you get a better idea of when you are full. This way you end up consuming less calories. So, are you hungry for BBQ now? The following recipes are sure to get your mouth watering. Give them a try and let us know which one is your favorite. Cut the eggplant into cubes and marinate in olive oil, garlic and parsley. Fry the cubes in a pan until they are golden brown and tender. Place them in a bowl and purée them with a hand blender. Season with sesame paste, 2 Tbsp of crème fraîche and lemon juice. The dip also works without tahini. 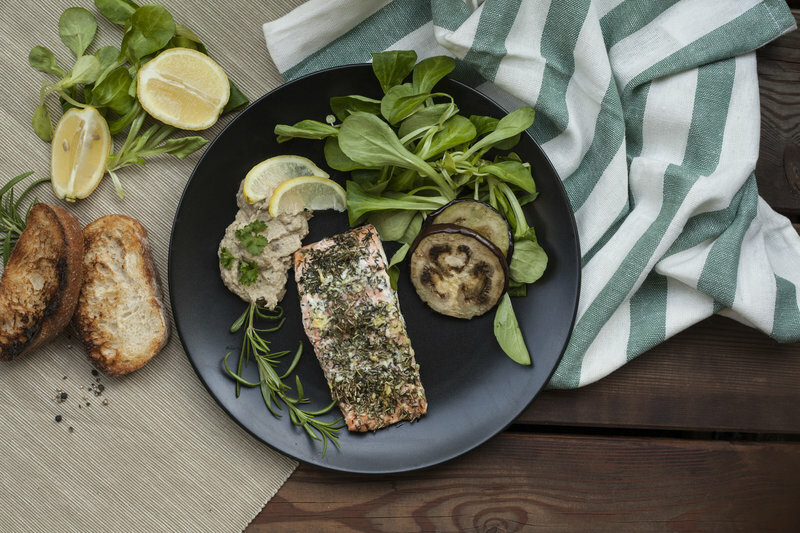 Place each salmon fillet on a separate sheet of aluminum foil coated with olive oil and season with rosemary, dill, oregano and lemon zest. Seal the foil to form packets and place them on the grill for about 15 minutes, depending on the temperature of the grill. For the marinade, combine the olive oil, balsamic vinegar, the pressed garlic and the freshly chopped rosemary with the spices. For the skewers, wash the chicken breasts, dry them with a paper towel and cut them into 2.5cm cubes. Clean and wash the zucchini, bell pepper and eggplant and cut them into 1.5cm thick slices. Wash and half the tomatoes, too. Place the vegetables and meat in a large bowl and mix well with the marinade. 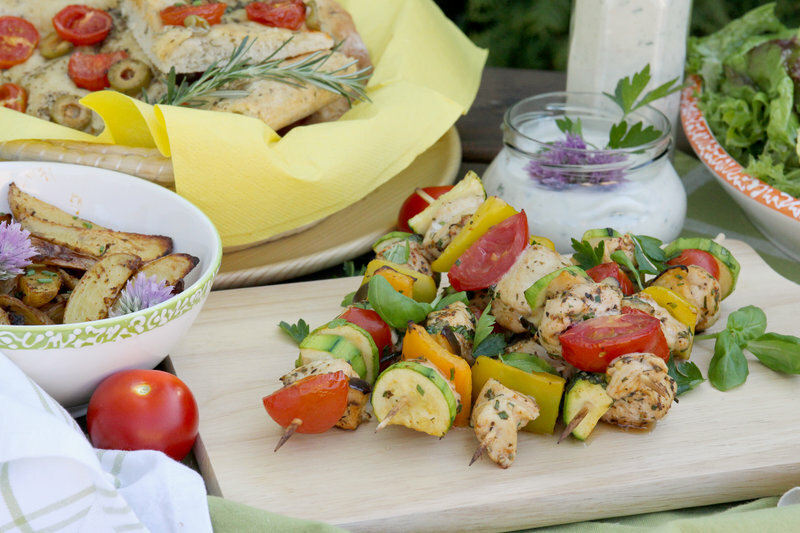 Thread the 10 wood skewers, alternating the chicken with zucchini, bell pepper, eggplant and tomatoes. Grill on all sides until the chicken and vegetables are done. Wash and finely chop the parsley, chives and basil. Mix the yogurt and sour cream, add the herbs and lemon juice and season with salt and pepper. Wash the potatoes, cut them lengthwise into thin wedges and place them in a bowl. Add olive oil, rosemary, salt, pepper and red pepper flakes and mix well. Spread the potato wedges in a baking dish or a baking sheet lined with parchment paper. Place the baking dish or sheet on the middle rack and bake for about 40 minutes in a preheated oven (200°C/400°F), turning them once in the middle. Wash the rosemary twigs, dry them with a paper towel, strip the needles from the stems and chop them finely. Crumble the yeast into 150ml of lukewarm water and let it dissolve. Combine the flour, a ½ tsp of salt, half of the rosemary, 2 Tbsp of oil and the diluted yeast and knead into a smooth dough using the dough hook of a mixer. Cover the dough and let it rise in a warm place for 30 minutes.Knead the dough again and then dust the work surface with flour. Shape the dough into 6 circles or roll it out to make a square. Line a baking sheet with parchment paper and place the dough on it. Mix 4-6 Tbsp of oil with salt, freshly pressed garlic and rosemary and sprinkle this mixture on top of the dough. Cut the olives and cherry tomatoes in half and spread them over the dough. Bake the dough for 10-15 minutes in a preheated oven (200°C/400°F) until golden brown. Wash the asparagus and cut off the woody end at the bottom (about 2cm). Coat with a mixture of salt, pepper, thyme and rosemary and grill for about 15 minutes. 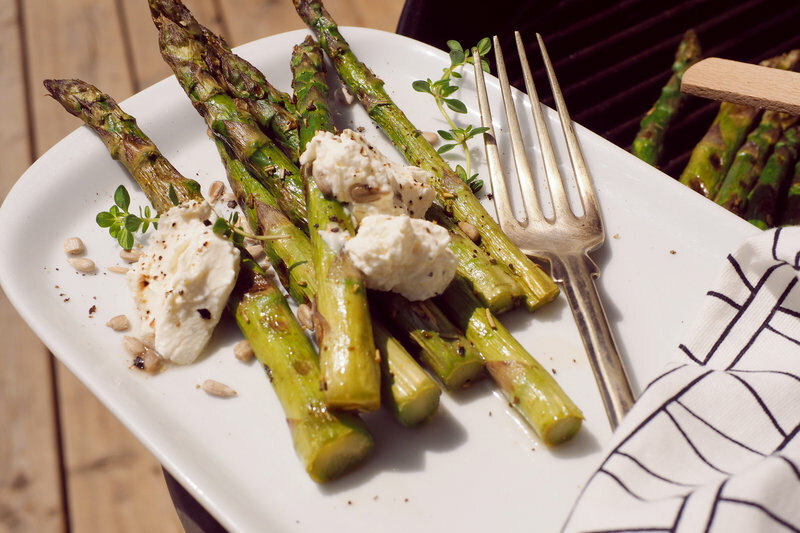 Combine the crème fraîche and goat’s cheese to form a cream and serve the asparagus together with the cream and sunflower seeds. Dissolve the yeast together with 3 tsp of sugar in warm water or soy milk. Place the flour in a bowl, create a hole in the middle, pour in the dissolved yeast and let it sit for 10 minutes. Add the rest of the sugar, the salt and the margarine and knead the dough well. Then cover with a wet towel and let it rise in a warm place for about 40 minutes. Shape about 10 equal-sized balls from the dough, spread them out on a baking sheet lined with parchment paper and flatten them. Cover them once again and let them rise for about 20 minutes until they are approximately twice their original size. Preheat the oven to 180°C (350 °F). Brush the buns with soy milk or water and sprinkle them with sesame seeds. Bake them for 15 minutes, take them out of the oven and cover them with a towel so they remain nice and soft! Strain the beans and lentils and blend them together with the other ingredients in a food processor. If the mixture is too wet, add some more oats. Soak the flaxseeds in 5 Tbsp of warm water for 5 minutes and then mix them in. Shape the mixture into patties and grill on both sides. Wash the carrots and peel the sweet potatoes. Then cut them into 10cm long sticks. Place them together with the olive and the herbs in a plastic bag or sealed container and shake well. Afterwards, place them in an aluminum pan and grill them until they are golden brown. Wash and dice the tomatoes and finely chop the onions. Place all the ingredients in a pot and cook on low for 45 minutes. Then pass the mixture through a sieve. Return the remaining sauce to the heat and reduce to the desired consistency. Season it with salt and pepper and perhaps some vinegar, if needed. Then pour the ketchup into a clean glass jar and seal it while it is still hot. For the sorbet, press the lemons and bring the juice to a boil with the water and sugar. Add the lemon zest and vanilla sugar and let the liquid cool. Pour the liquid into a flat container and place it in the freezer. Make sure to stir it regularly, so the sorbet does not freeze completely. Cut the pineapple in slices and remove the stem and skin. Coat each slice with some maple syrup or honey and grill briefly. 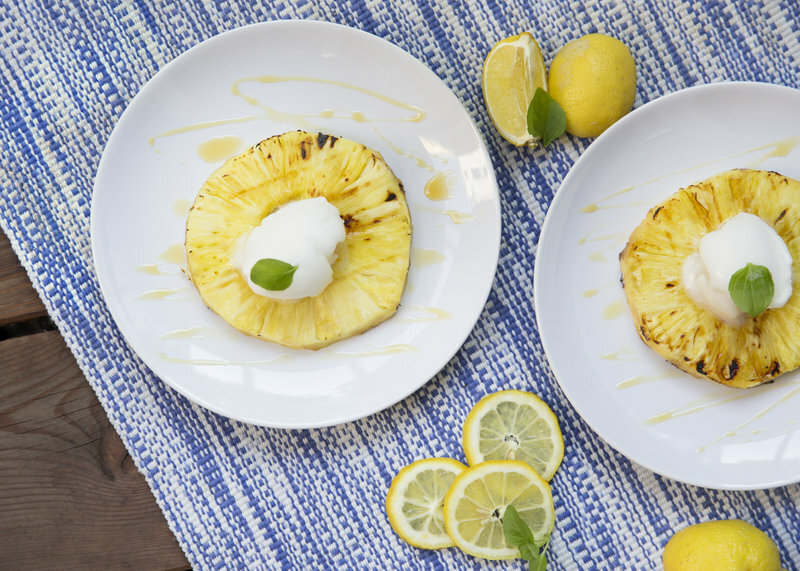 Serve the glazed pineapple slices together with the sorbet. Next postDetox and Cleansing – What Truth Is There to the Myth?